In these examples the "canal", of the 3 empty spaces, between the 3 sets of diverging parallel lines, is in line with, or pointing to the core. Patti wrote: Lynn, I don't think being open to the core represents the narrowest side, as I just illustrated. It really isn't the narrowest side, it's the side that is open. Show me where it says it's the narrow side. It can appear that way in some loops because the two parallel lines coming into the looping pattern (and there is only 1 of the 3 pairs that enter from the side, the other two diverging parallel lines are surrounding the pattern) is sort of Y shaped. Rather than 120 degrees from branch to branch. There is only one reason: the smallest angle - the RED ANGLE - in the picture below is the only angle related to point E that is smaller than 90 degrees. And the red angle is obviously not opening towards the core. The size of two other two angles is irrelevant - because they are both larger. Only the smallest angle matters because the branches involved in that angle represent the 'splitting' branches that result from the 3th branch. And because in point D the only angle is 'open to the core', therefore point D is identified as the only option for the location of the DELTA. PS. 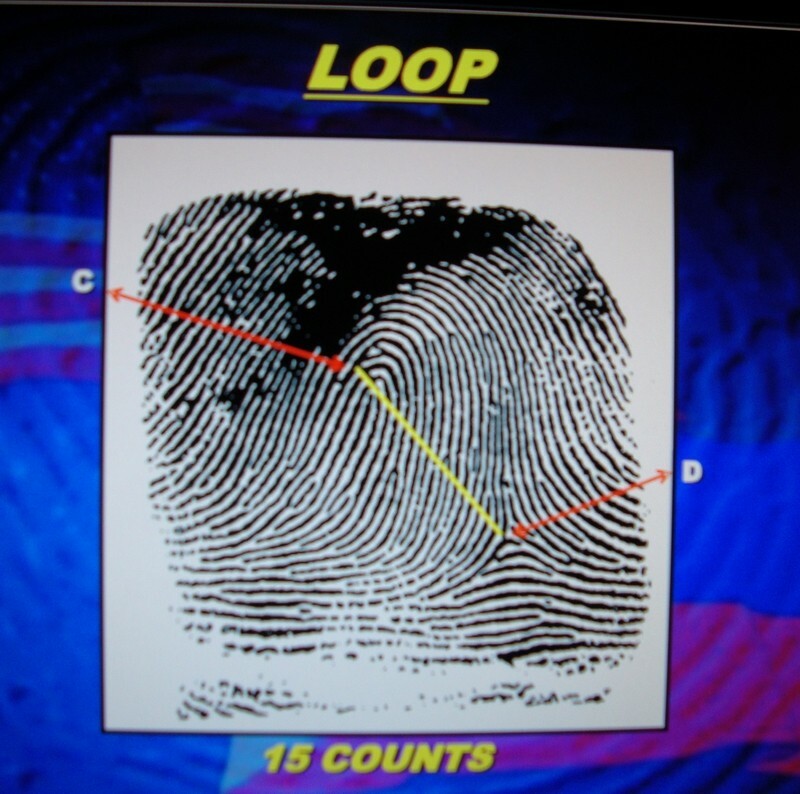 Patti, I have noticed in some comments that you are even considering the 'issue' regarding fingerprint examples which have a clear triradius; but this doesn't make sense at all... because the F.B.I. 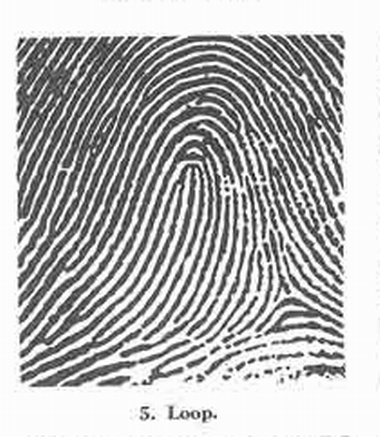 book clearly describes that the 'issue' only matters regarding fingerprints that have multiple 'bifurcations' - without the presence of a triradius. If there is a clear triradius then that is always the DELTA. If there are two triradii... then it is very likely that there is also a whorl (or traces that could be related to a whorl). I would add, where you have drawn the higher up incorrect delta, as not being open to the core, they also mention it doesn't follow the rules of type lines either. Type lines and delta lines either in reality or visually as canals, follow the pattern outline. This is also part of the definition of "open to the core"
But, I do think that fig. 26 is confusing when it says that E is not "open to the core" as it's the only example like it. My thought is that the rising ridge is abuting the right branch from D. Then to see the ridge instead as rising from the D line, it would be an upthrust from a horizontal plane - 180 degrees. Patti, there is nothing confusing about figure 26! But regarding your comment in the picture that you just posted - it is 'correct' (yes, an angle of 180 degrees results in a straight line)... but I think your ARROWS in the same picture do not make sense... what are your arrows pointing at? And how do your arrows relate to point E??? Therefore, I think... ... you keep struggling with the concept of what an 'angle' really is. Your earlier assocation that a 'right angle' could manifest as an angle of 45 degrees was a troublesome 'early sign'. Patti, if I would ask you to 'measure' the GREEN LINE that I added to the picture in my former post; would you be able to describe the size of that angle...? edit: What is the size of the 'angle' between my two green arrows? Patti, if do you understand the concept of 'angles' and 'right angles' ... then you should be able to find the right answer to this quize within seconds. If not, that would probably proof my point. edit: Patti, what do your red arrows point out? Can you tell where they put the delta in fig. 83 to get 20 ridge counts? Definitely can't be the narrow opening of a bifurcation. Again... the issue related to the words 'open to the core' (as mentioned in the first DELTA-rule on page 12 in the F.B.I. book), do NOT relate to situations where there is a clear triradius... NOR should it be applicated to fingerprints where there is only one 'bifurcation' that could be described as the DELTA (which is obviously the case in figure 83 ... edit: correction: there is another DELTA-option: see my next post!). Therefore your question regarding fig 83 is irrelevant to the issue that we are discussing (again, because there is only one point where the DELTA can be positioned). You have drawn a tented arch formation with your yellow lines. It's part of that concept where there is a triangle at the horizontal plane with a tent pole above it. Then if there is a single recurving loop it frequently is angled very tightly, 90 degrees or less. So, Lynn pointed out correctly... that you can not identify the pattern of a fingerprint from a triradius only (as you suggested regarding example 3.5F from Schaumann & Alter). Your mistake indicates that you are working with a 'tunnel vision': you appear to be focussed on details without considering the context. Second, regarding the Disney print, example 133 in the F.B.I. book is an example that approaches the loop (but is a tented arch because there is no ridge count). 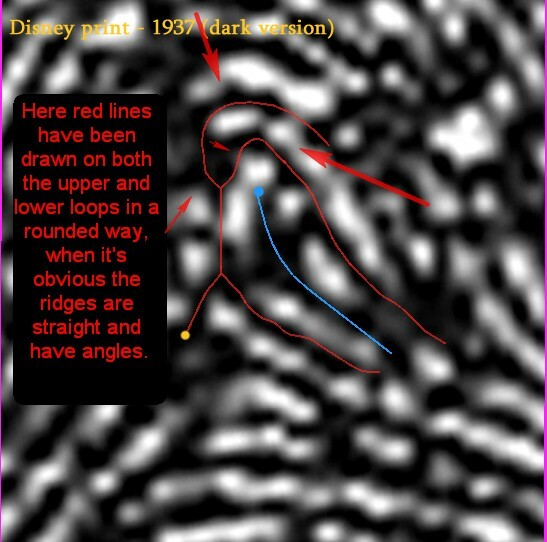 However in the Disney print there is also the looping ridge line, which explains that there is at least a 'ridge count = 1'... and applying Penrose's rule and/or the issue with the shoulder line would result in a higher ridge count. And remember, page 41 describes that 'bifurcations' in a looping ridge line do not spoil the ridge line (because the 2 bifurcations do not show any no sharp sudden changes in direction). So, that takes away another of your arguments. The angles that are sharp are at the recurve. You have drawn rounded lines over angular lines. The angular shape is not an illusion as it is backed up by the extremely similar right index finger. This curving recurve is simply something you want us to see. Anything that isn't a looping form, is either bleary ink, too much ink, missing ink. etc. etc. etc. Again... the issue related to the words 'open to the core' (as mentioned in the first DELTA-rule on page 12 in the F.B.I. book), do NOT relate to situations where there is a clear triradius... 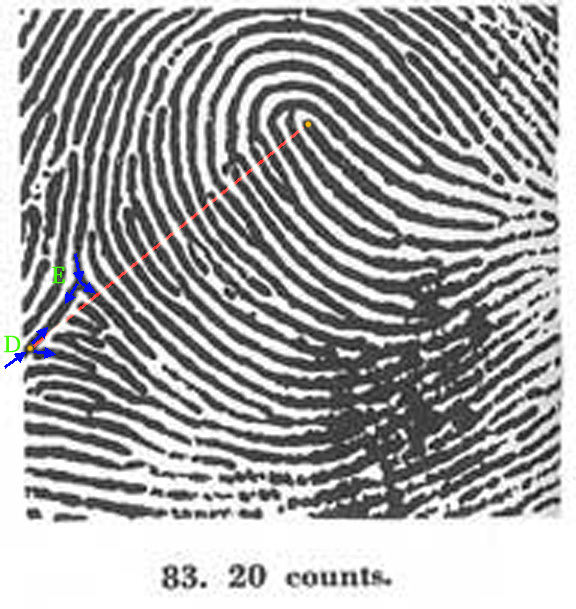 NOR should it be applicated to fingerprints where there is only one 'bifurcation' that could be described as the DELTA (which is obviously the case in figure 83). does that mean you don't know the answer? Only point D is 'open to the core' (point E is obvously 'not open to the core' because the smallest angle is found between the two downward pionting branches)... and counting from point D result in exactly 20 ridge counts. The earliest example of a loop shows the narrow angle not pointing to the core. 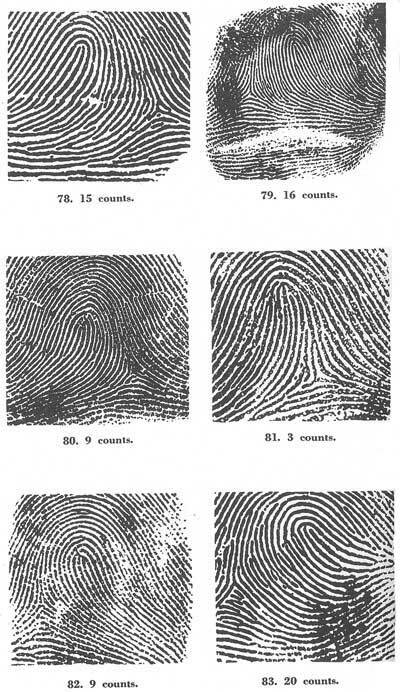 I have looked through many examples of loop and whorl fingerprints. There are many with a triradius that has the more narrow angle open to the core. The thing is, when that happens, there is usually, as in fig. 5, a branch aiming back down in to or near the area of the diverging parallel ridges, and that moves the delta to that point unless it's on the other side of an imaginary line that divides the inside of the parallel lines to out where they have begun to diverge. I really don't think that there is any rule that states that only the narrow open side of a triradius or bifurcation can be open to the core. I haven't seen anyone quote from any source yet. Seems more like an opinion or a theory. Patti wrote: The earliest example of a loop shows the narrow angle not pointing to the core. True...but in figure 5 there is no other 'bifurcation' at all that could serve as the delta: so that is the essential difference with figure 83...! PS. So... remember: the rules on page 12 are only meant to be applied when there are MULTIPLE bifurcations! Patti, it is not 'option', nor a 'theory'... it is only common sense! But admit, this issue does require a proper understanding of HOW TO MEASURE the angles in a 'bifurcation'. Therefore I presented my question - featured with my little quiz - ... ... but it appears that you don't want to answer my question. Is that correct? I don't have a protractor handy - still probably packed away in one of the many unpacked boxes from moving. But, I can use the 90 degree corner of a piece of paper to tell which angle is the largest. For instance, using my trustly little paper square, I can tell that the delta shown below has the smallest angle not open to the core. Correct... but I wonder why you still avoid to answer my quize-question. I don't see any reason why Patti should have to answer that quiz question. 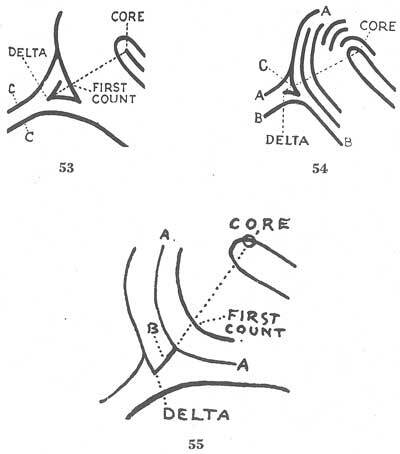 ● The delta may not be located at a bifurcation which does not open toward the core. 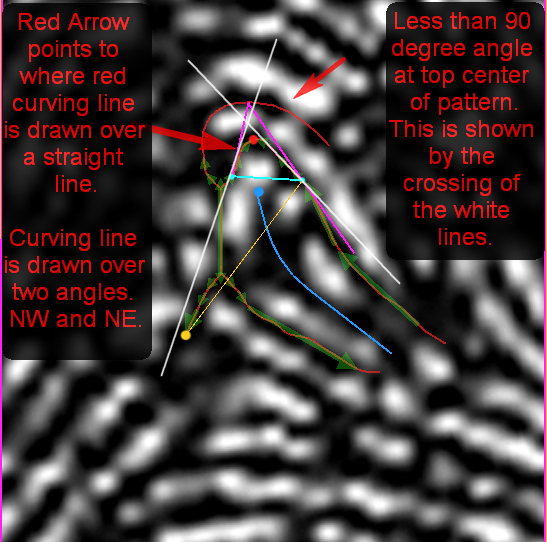 Fig 26 shows us that E does not open to the core, your 180degree straight line is not 'open to the core'. Back to basics - A bifurcation is the forking or dividing of one line into two or more branches. So for a bifurcation to be open to the core, it is the fork, the two branches, the V that must open towards the core. Not the side, not the ridge where the fork originates. It is the fork itself that must 'open to the core'. What about the image I just posted. I would call the delta location a bifurcation. The smallest angle is open to the NE. p.s. and yes, I keep trying to point out that the 180 degree sides are a straight line. OOPS Patti I seem to have just hit 'edit' instead of 'reply' & accidentally edited your msg!!! ummmmm Lynn? Did you edit inside my post or am I as someone here keeps pointing out 'out of my mind' ? yes sorry I must have hit 'edit' instead of 'quote'. Hope I fixed it OK now. sorry. Lynn wrote: OOPS Patti I seem to have just hit 'edit' instead of 'reply' & accidentally edited your msg!!! Patti wrote: What about the image I just posted. I would call the delta location a bifurcation. The smallest angle is open to the NE. do you think there are two possible locations for the delta? is it a bifurcation or a recurving ridge, or is it on the end of that rod? yes of course 180 degrees is a straight line, but, sorry, I don't understand the relevance of you saying that. There is only one delta location. I think the end of the rod is still inside the parallel lines before they have actually diverged and not centered at or out in front of the diverging parallel ridges or type lines. 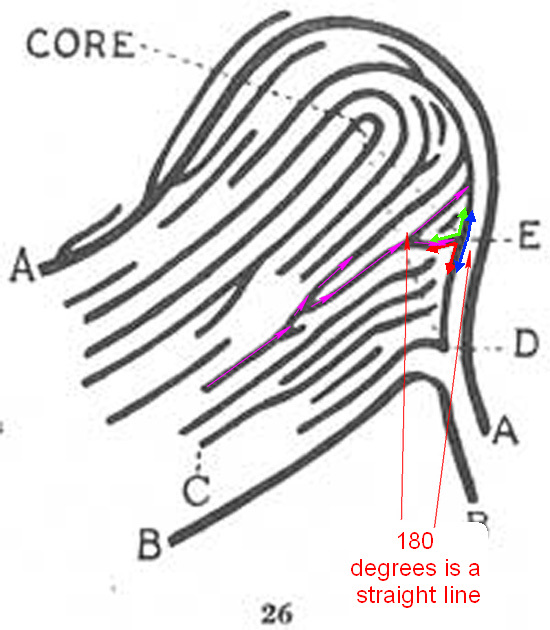 This would take the delta to the end of the rod where it touches what could be seen as a side of a recurve, but it is also part of a bifurcation. I've looked through several slides and scrolled through the web page of the book and there is nothing that says the angle or side that is open to the core is the smallest angle. 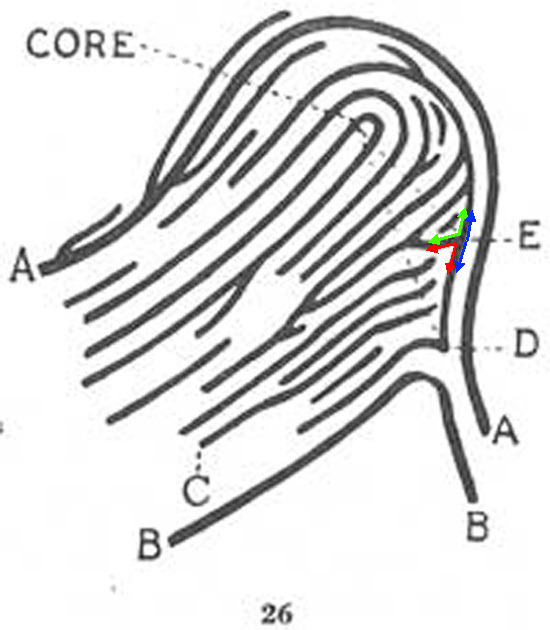 In figure 26, the bifurcation at E is closer to the core than the bifurcation at D. However, E is not immediately in front of the divergence of the type lines and it does not open toward the core. 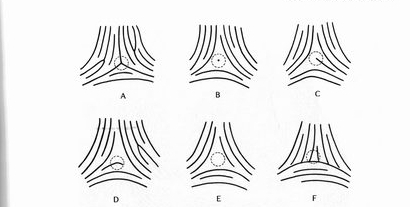 A—A and B—B are the only possible type lines in this sketch and it follows, therefore, that the bifurcation at D must be called the delta. The first ridge count would be ridge C.
I know we disagree as to why E is not the Delta. I think because they mention type lines before and after they say it's not open to the core is significant. When the delta is open to the core is has the appearance of reaching out on each side along with the type lines and although doesn't enclose the pattern like the type lines do, it still has branches that reach out in each direction. There is no clear explanation of what open to the core means. There is nothing that says a bifurcation or triradius must have the most narrow angle open to it. There are examples of prints with angles that are narrow in other directions. A white space must intervene between the delta and the first ridge count. If no such interval exists, the first ridge must be disregarded. In figures 53 and 54, the first ridge beyond the delta is counted. In figure 55, it is not counted because there is no interval between it and the delta. 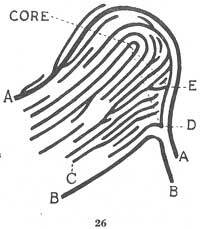 Notice that the ridge running from the delta toward the core is in a straight line between them. If it were not, of course, an interval would intervene as in figures 53 and 54. I mention 180 degrees as a straight line because a straight line is a horizontal plane and a line rising between 45 and 90 degrees from it is an upthrust or a spike. So E doesn't fit the description for a delta, nor type lines and it's in the wrong place. That's why I see the bifurcation as rising ridges that split and one branch touches or abuts at E.
I think that is what they are showing. It would have been easy for them to say, the angle of the side open to the core must be no less or no more than such and such degrees but they do not. Not anywhere. I think it's going to be an individual thing to each loop fingerprint as to the possible variance of the angles.